Are you a little stressed out? You know what could help that, cats. A cat purr has been shown to have relaxing effects on humans as well. If you can’t actually get a pet cat but still want the benefits check out Furry Friend, the website that gives you the cat purr without the fleas. Pet ownership has a lot of benefits but there are some downsides. Like having to constantly care for another living being. 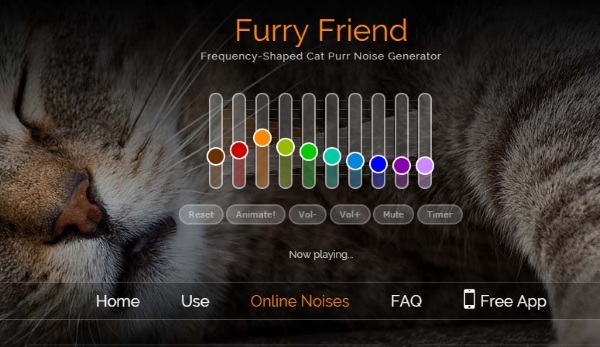 If you can’t handle that pressure, check out this site that will let you enjoy the sound of a pleased kitty without the actual cuddling. This site is perfect for the cat lover with allergies or a mean landlord. You can check out this site at any point in your day when you’re feeling a little overwhelmed, no matter where you’re at! Unlike a real cat, you can control how loud it purrs and the unique sound of it. It’s no replacement for the real thing but in pinch, it’ll do. Next time you’re a little overwhelmed, open up Furry friend for some free relaxation.